This cozy home is walking distance to the water. This wrap around porch is the perfect added touch to this home. Relax after a long day at the beach in this hammock. Spend time with loved ones in this light and airy living room. Rest and recharge after a long day in this living room. Cook a meal in this galley styled kitchen. Stay warm at night with this furnace. Unwind after a long day outside under the stars. Wash off after a day at the beach in the outdoor shower. 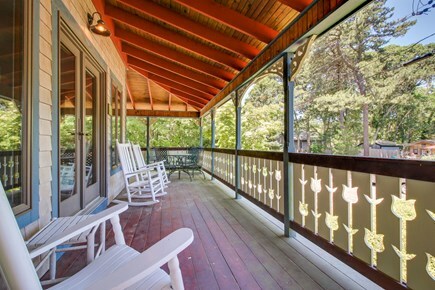 Experience luxurious serenity when you stay in this beautiful vacation home, featuring a deck, large wrap-around front porch - complete with a hammock - and easy access to the water. Perfect for a small family, two couples, or a weekend retreat with friends, this lovely, well-maintained rental is sure to make you feel at home. 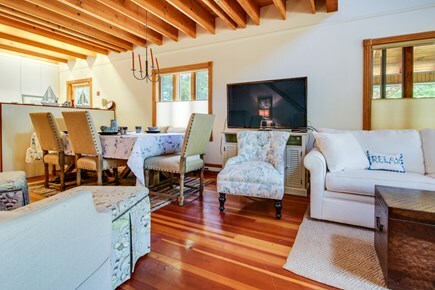 Located on Martha's Vineyard, this cozy home is within walking distance to the water, ensuring all the peace and quiet you desire, yet close enough to attractions, shopping, and dining to set you up for an effortless New England retreat. 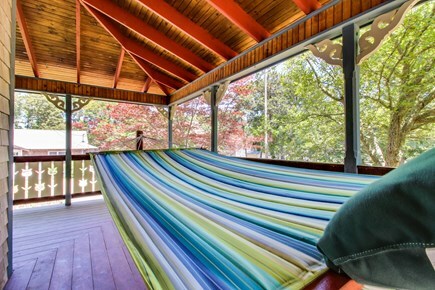 The covered, wrap-around front porch is an eye-catcher, bedecked with plentiful seating - including a hammock! - that entices you to sit back and begin your vacation. 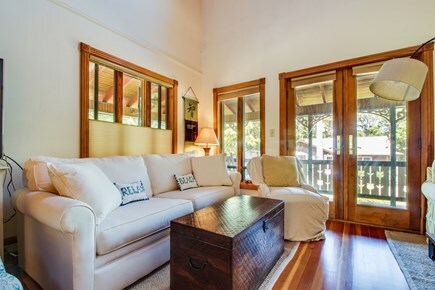 The interior is bright and cozy with white walls, shiny wood floors, and plentiful wood-trimmed windows and doors that bring in lots of fresh air and mood-elevating natural light. The living room features attractive, light-colored furniture, providing a comfortable spot for you to rest and recharge, or gather around for after-dinner drinks while you watch movies on the flatscreen TV, complete with cable and a Blu-ray player. Enjoy the bright and cheerful feel this space offers in the morning as you surf the Internet with the free WiFi to check out area attractions and create your itinerary for another fun-filled day. The open-concept design of this home puts the dining area right next to the living room, and features seating for four under a candlestick light fixture. 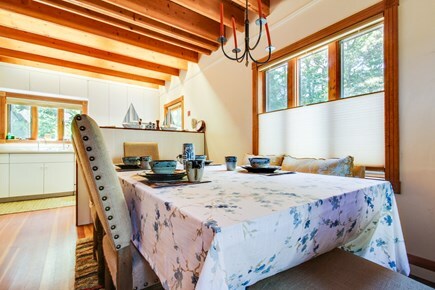 This is the perfect place to enjoy the company you're with while sharing a meal cooked in the galley-style kitchen. Light and bright, with white cabinets and appliances, the kitchen provides you with plenty of storage and counterspace to prepare your favorite meals and clean up with ease. 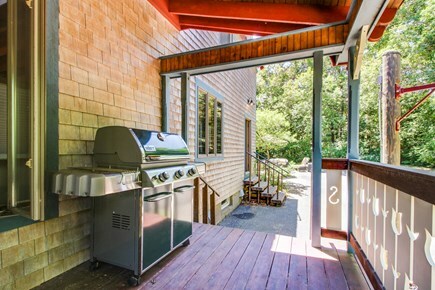 If the weather's nice and you feel like being outside, take your meal out to the deck, accessible through the kitchen door, or whip up an easy, no-frills feast on the gas grill, and savor your dinner on the ample and attractive patio furniture. Bring out the wine or your favorite microbrew, and enjoy a slow wind down as the sun sets on the lovely backyard. 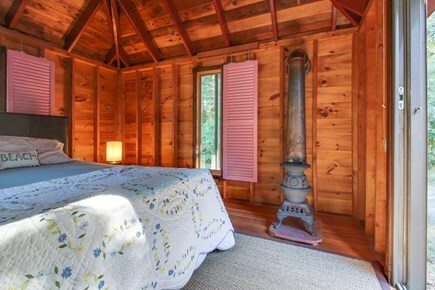 This two-bedroom, two-bathroom home accommodates four guests. Whether you choose the second bedroom in a separate building, which has access to the deck, or the more open loft space upstairs with a private half-bath, you can't go wrong, as they both feature comfortable queen-size beds and plenty of natural light. Prefer to pack light? Not a problem, as this home has an in-house washer and dryer for your added convenience. For a little variety, check out Edgartown Lighthouse, under eight miles away, or South Beach, which is less than 10 miles away. Travel a bit further to Aquinnah Cliffs Overlook for an awe-inspiring view of Vineyard Sound. Or stay close to home and enjoy the bike path just at the end of the neighborhood road. Have a hankering for some fresh, just-picked produce? Make a short nine-mile trip to Morning Glory Farm and enjoy a hearty lunch of soup and salad, made with the farm's own ingredients, as well as fresh-baked goods like breads, muffins, and pies. Also just nine miles away is The Farm Institute, which offers tours and Meals in the Meadow, created with their own fresh, locally grown produce and meats. Come to this beautiful vacation home with a plan to rest and rejuvenate, and leave feeling transformed. Make your reservation today, and start making plans! This is a two bedroom house. I was expecting the house to be extremely small but to my surprise it wasn't. It was large enough for two couple to stay comfortably. 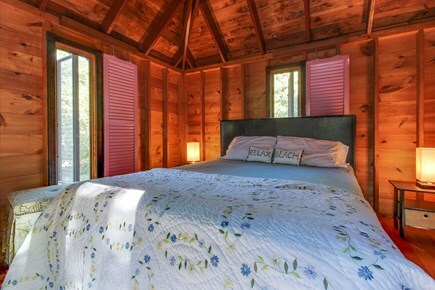 The second bedroom is separate from the main house. I will definitely stay here AGAIN! This place was perfect for my boyfriend and I. Even though it is listed as a 2 bedroom, the second bedroom is separate from the house, so I would only recommend 2 people going who don't mind sleeping in the same bed, unless the couch is going to be utilized. But it was a very cozy place. 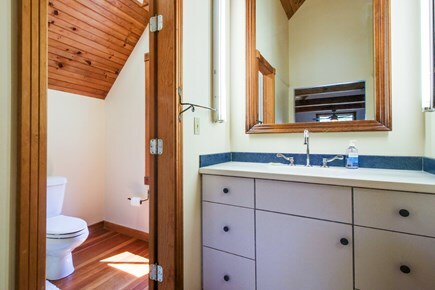 I loved the upstairs bathroom and shower. Good, quiet location. I was very satisfied with this visit. Great location near other beautiful homes, short drive from our favorite beach on the island and many good restaurants. The floors, stairs, furniture, entertainment system, kitchen- everything was wonderful and worked beautifully. A quiet and gorgeous street to be on. Would recommend this to anyone wanting to stay on the island. 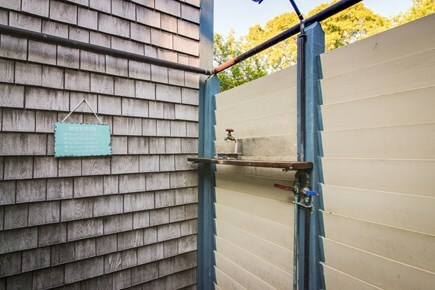 We spent a great weekend in Martha's Vineyard and had a very lovely place to stay. The house is gorgeous and cosy. One thing to improve: more dishes so that we can cook meals for more than 2 persons. We spent a weekend with an adult child in early September(after Labor Day). The weather was perfect. The house is everything as advertised. 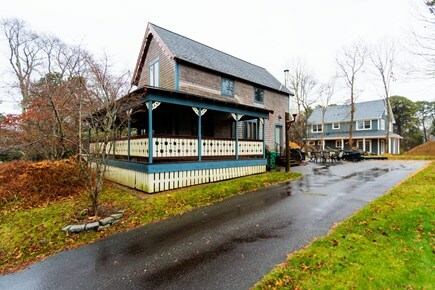 The house is about 1.5 miles from downtown Oak Bluffs. We drove or biked into town and the center town park, and did not walk, although we could have if we desired. Quiet, safe, appropriately proportioned for a couple or 2. The front porch with rockers and hammock was lovely. The house is decorated nicely. The furniture is new, comfortable and there is comfortable sitting for about 10 in the living/dining room. The house itself is small, but perfect for a couple or 2, but no more. 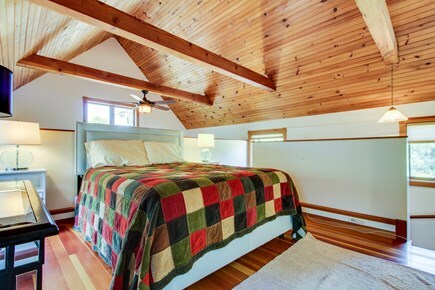 The master bedroom is on the second floor with a new bathroom, shower and sink, walk-into closet and a comfortable bed with new mattress and bedding. The rear guest house is probably about 200-225 sq. feet. Great for my daughter or for a couple. No indoor plumbing there, with access to an outdoor shower available. 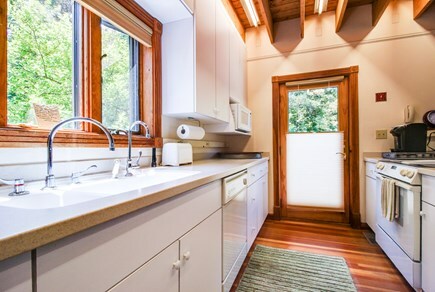 A bathroom with toilet and sink are on the ground floor next to the kitchen. The kitchen itself is well designed. The Keurig works great. Outdoors, is the porch, grill, a slew of really nice, comfortable outdoor patio furniture surrounded by a shady wooded yard. The cleaning team is the best I have ever seen. The house was spotless. I wish that I could hire them to clean my house on a regular basis. I understand that this is a new listing for Vacasa. There were a few very minor items such as burned out lamp bulbs, which were handled expediently by Don, the manager. We called on Saturday night, he arrived Sunday morning and fixed everything quickly and without bothering us at all. We enjoyed our visit so much. The check in experience was very seamless and the house has everything you need. 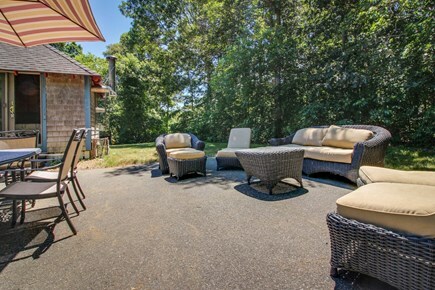 Location is in a more quiet area which we enjoyed and is only five minutes drive from the ferry and five minutes downtown oak bluffs area.